It's possible your next trip to Las Vegas could benefit from your many years of video game playing, Kotaku readers. The Las Vegas Sun reports the Nevada senate committee is currently mulling a bill that would would pave the way for regulators to allow games that reward skill. "That vision may be on its way to becoming reality. A state Senate committee is considering a bill that would let gaming regulators allow more skill, as opposed to chance, on the casino floor. The bill suggests, among other things, that regulators outline requirements for games of skill and allow flexibility in payout percentages or a game's outcome. 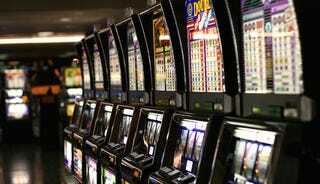 If the bill becomes law, it could pave the way for a flood of slot machines with games that play more like Super Mario than Wheel of Fortune." A big reason folks are interested in modifying current games of chance is because casinos are having trouble attracting younger demographics who want to do more than slap a single button. The question, of course, is whether games of skill would allow players to win every single time. The reason casinos work is because it's much more likely you're going to lose, but the opportunity to win big is what keeps you coming back. Skill-based games change the equation. Chris LaPorte has been developing his own gambling games slightly outside the boundaries of current regulation, however, and believes he's come up with a solution, even if he won't share it. "Have them call me, and I'll show them," he said. "There is definitely a way — my way — for the casino to be happy, just as much as the customer is happy with their experience." In the meantime, I'll probably stick to being boring and betting on black or red in roulette.